Another classic album for me is the debut by the Anti-Heros, an American Oi!/Punk band which were formed 1984 in Atlanta/Georgia. They took a hiatus from 1989–1993, but continued to record and play concerts through the early 2000s. 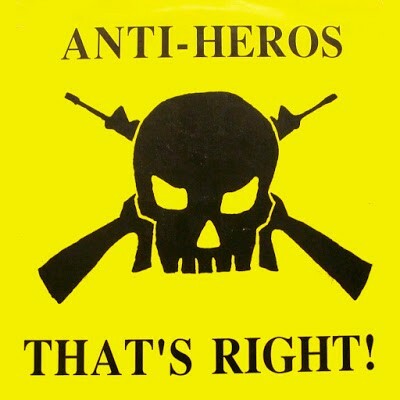 Anti-Heros are one of the first and most popular American Oi! bands. The original line-up consisted of Mark Noah (vocals), Mike Jones (bass), Phil Solomon (drums) and Joe Winograd (guitar). The band released two records on Link Records in the late 80s, ‘That’s Right!’ in 1987 and ‘Don’t Tread On Me’ one year later. Despite the band’s vocal admonishment of racism, their association with such ideals has long been a topic of contention among fans. Their theme song, “Anti-Hero,” featured as a standard in their live set. The Anti-Heros stance on racist Skinhead participation in the Atlanta Skinhead scene circa 1987 is addressed in the song “Some Fun” with Mark Noah’s lyrics “Now the Nazis are coming around, let’s run them out of town!” Their last studio album ‘Underneath The Underground’ was released 1999.